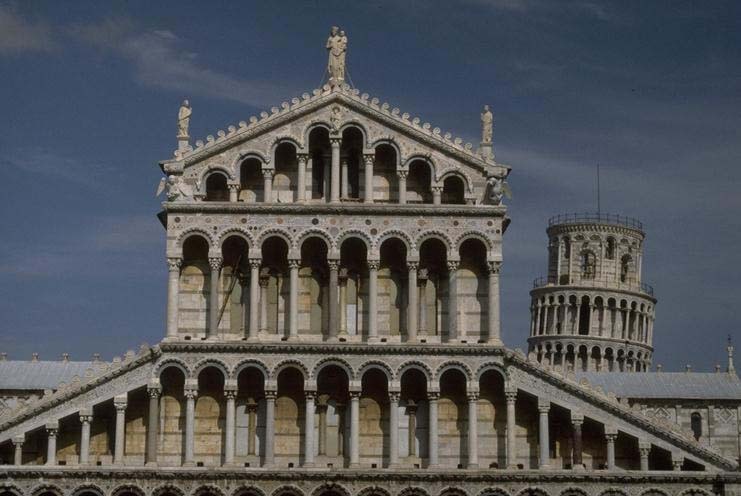 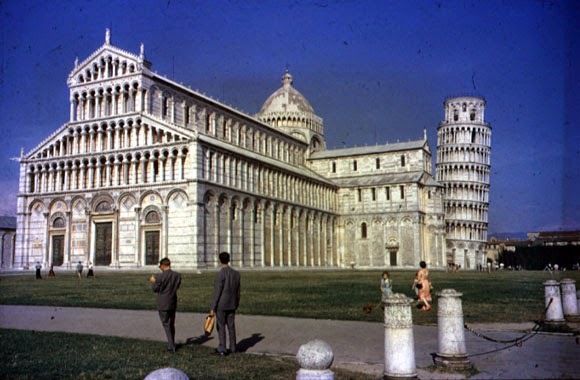 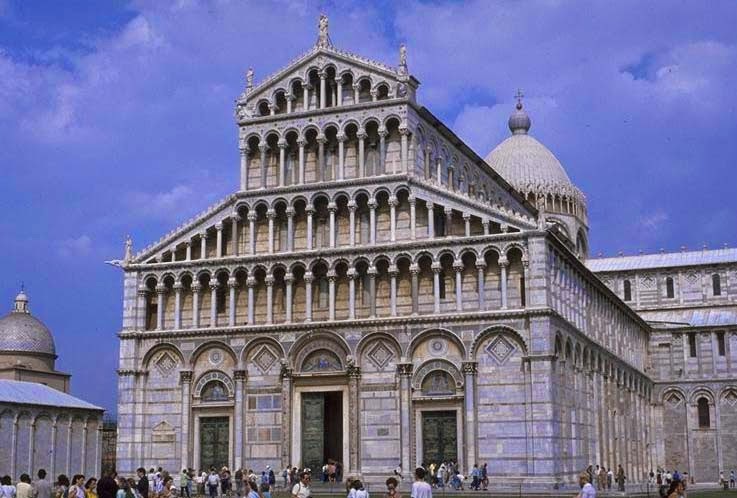 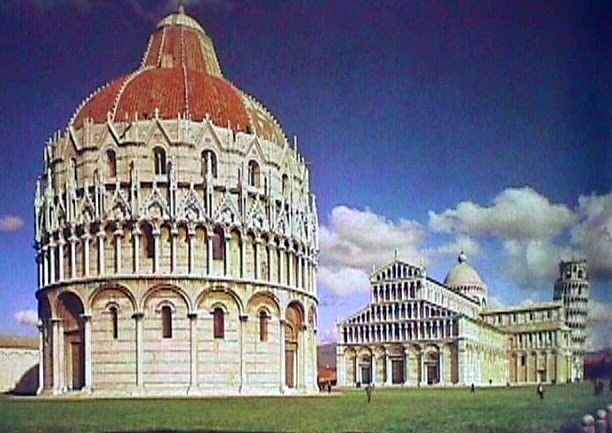 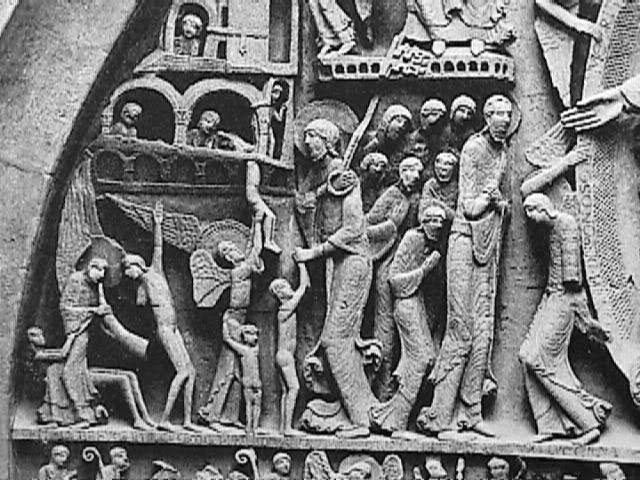 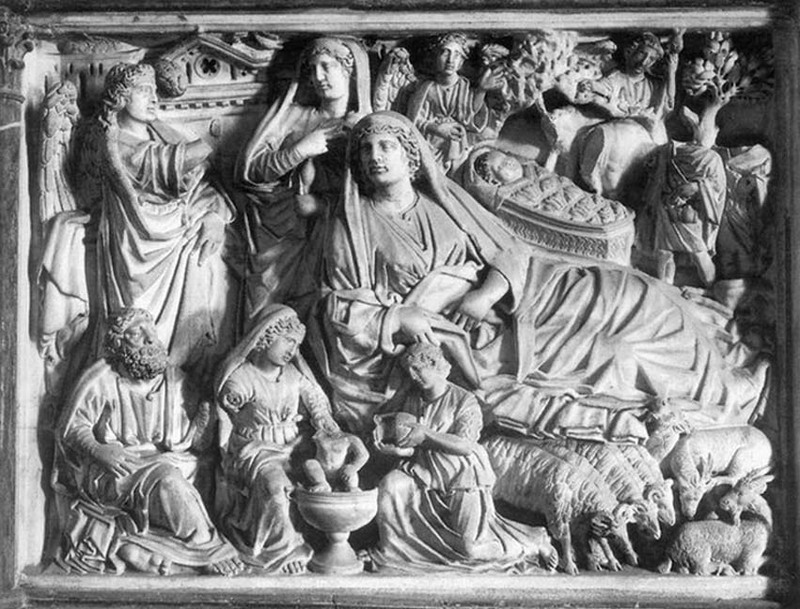 Iconography and Context: The Pisa Cathedral complex is a good axample of the combination of religious and patriotic devotion. 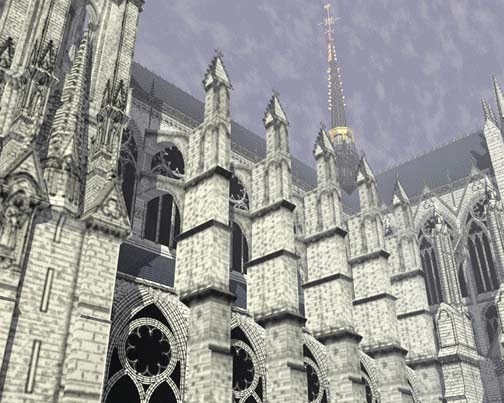 It is basically almost the heart of the community which built it. 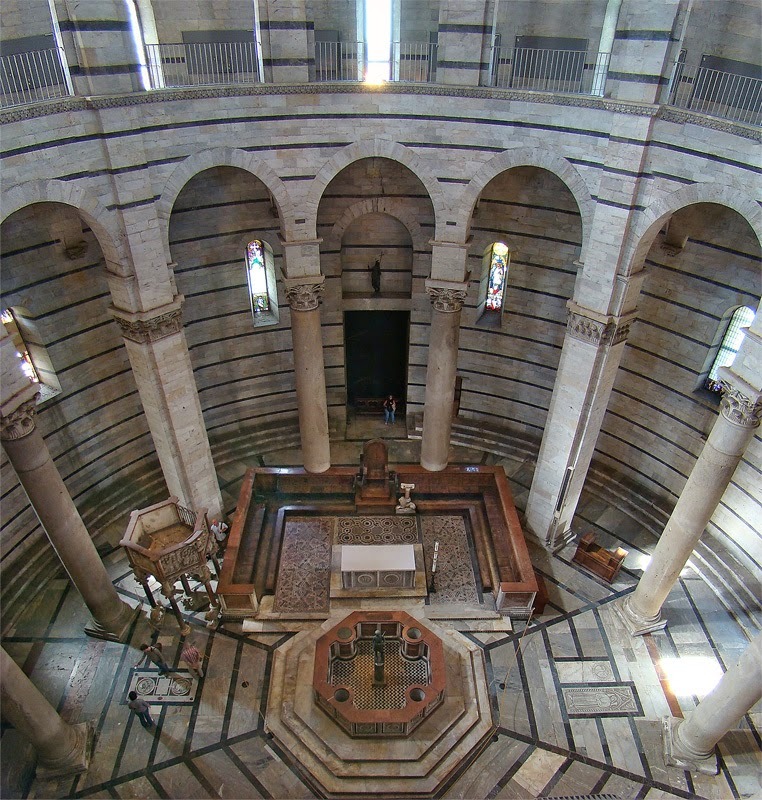 It was the place where, after you were brought into the world, you would be baptized in the Baptistry and when you died a prayer was said for you in the Cathedral. 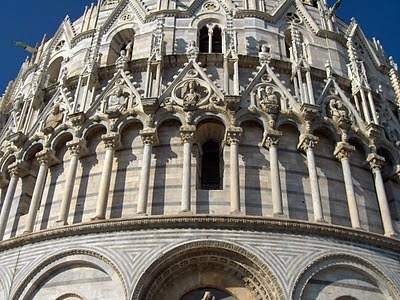 The bell in the "Leaning Tower" called you to worship and marked the hours of the day for you. 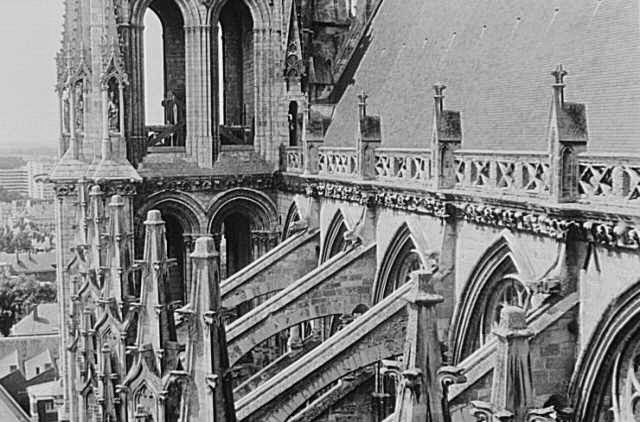 The fact that the entire complex took more than a hundred years to construct is key in understanding the effort, pride and consistency of the faith of the people who built it. 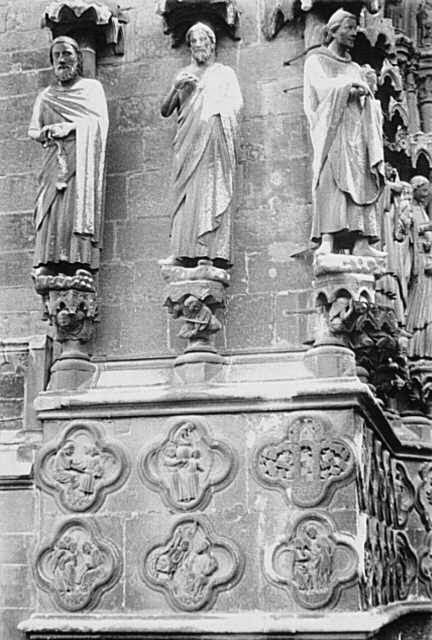 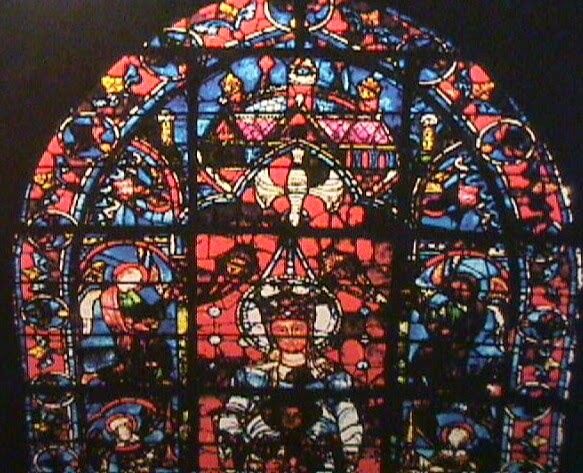 As such, the complex is an "icon" of devotion. 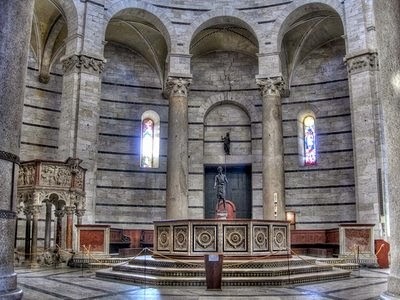 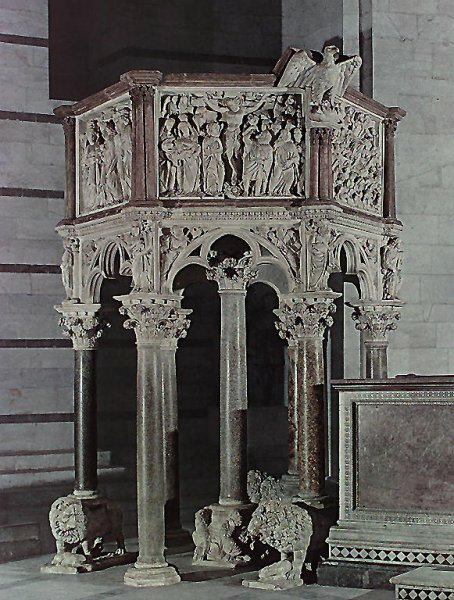 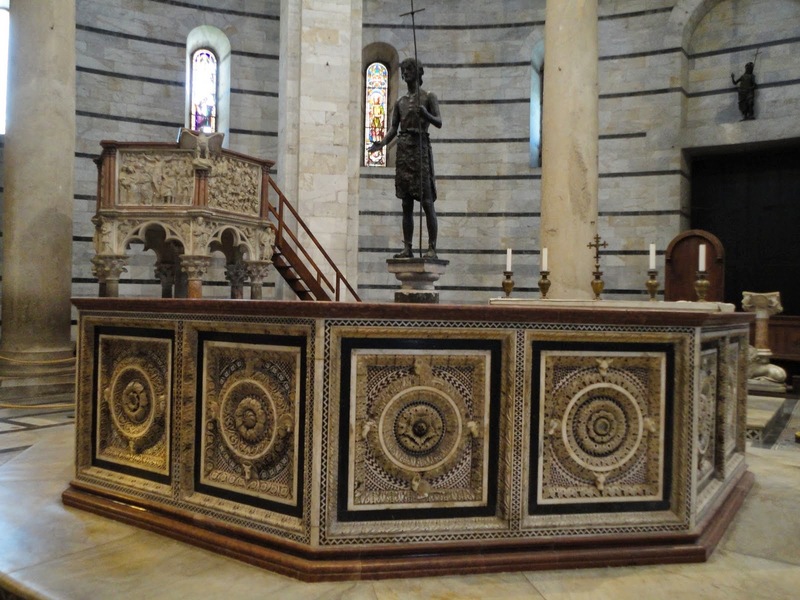 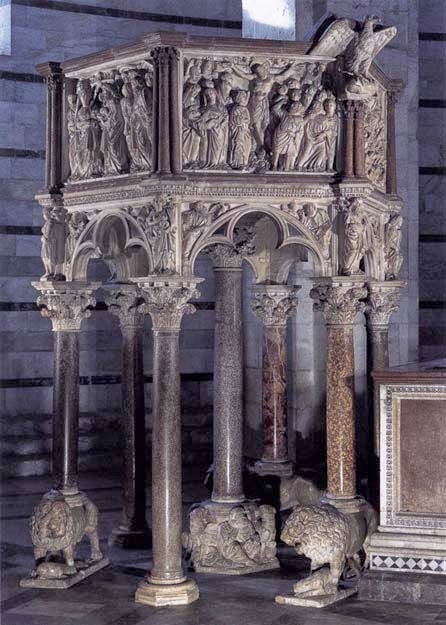 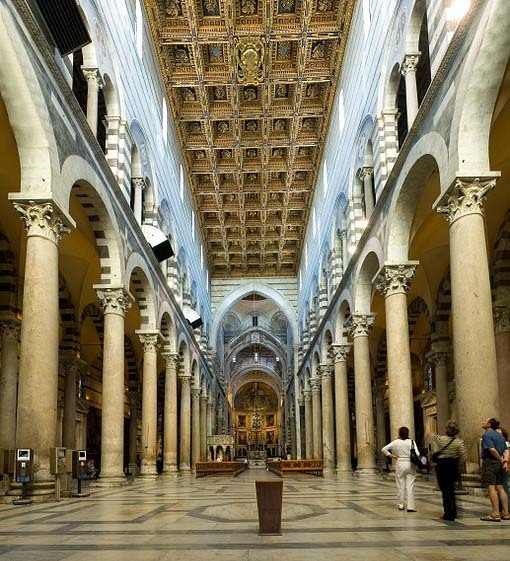 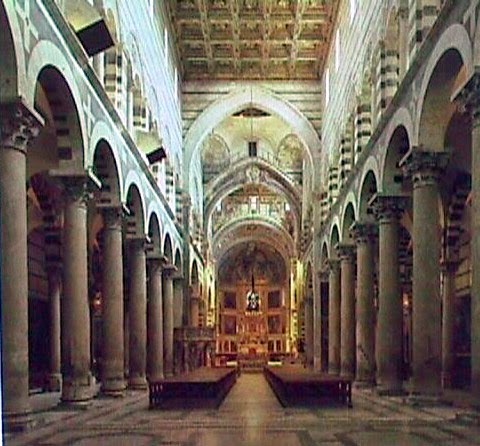 Form: According to the Encyclopaedia Britannica, "Both the cathedral and the baptistery are built of white marble with strips of black in the Pisan Romanesque style, which features colonnades and the decorative use of pointed arches." 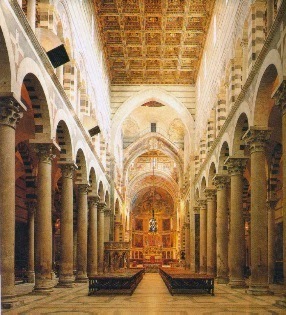 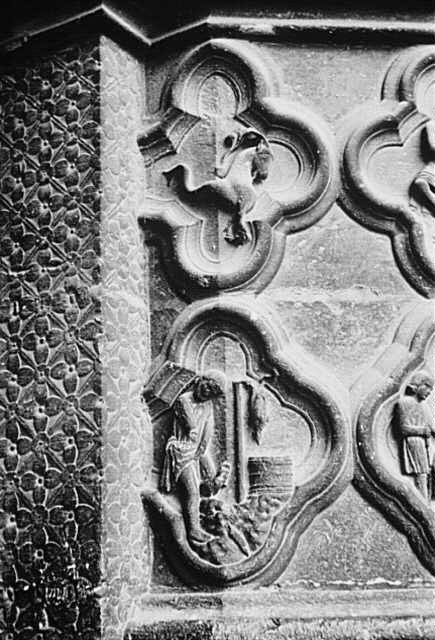 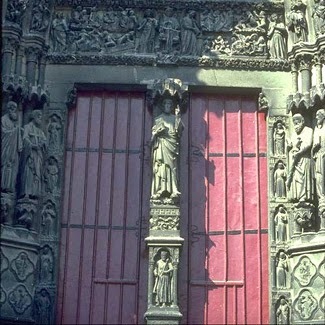 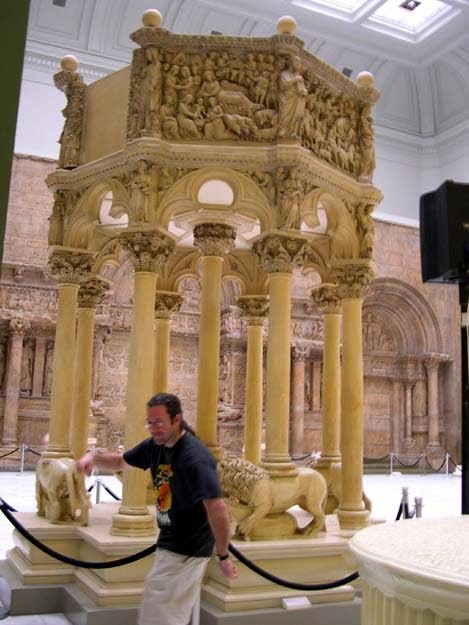 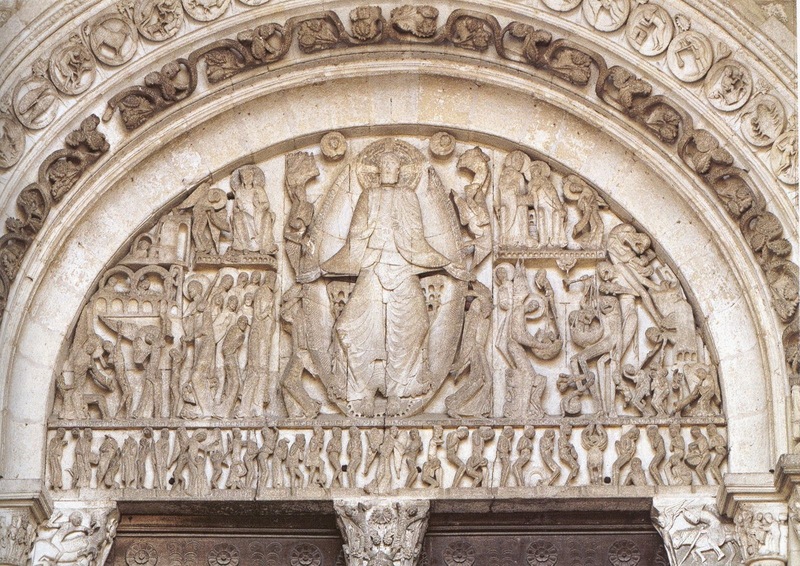 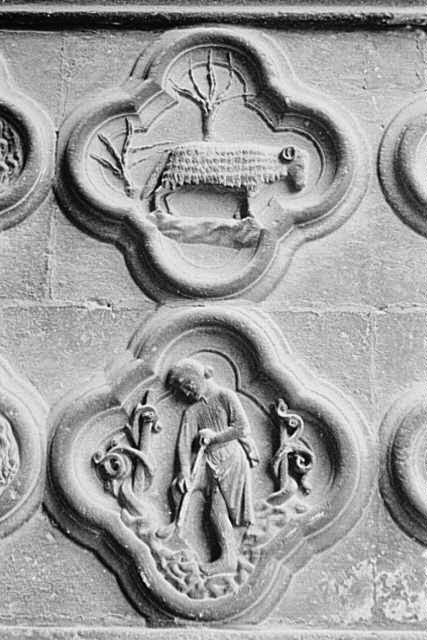 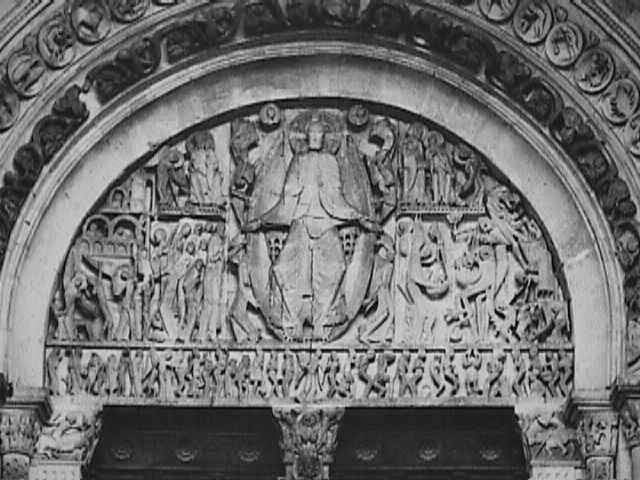 In this way the buildings are all made of sumptuous materials and also illustrate the fusion of several different periods' styles: the early Christian Basilican style complete with its cross vaults, the Romanesque technology of thick supporting arches, and the arches and highly ornate decorations of the Gothic style. 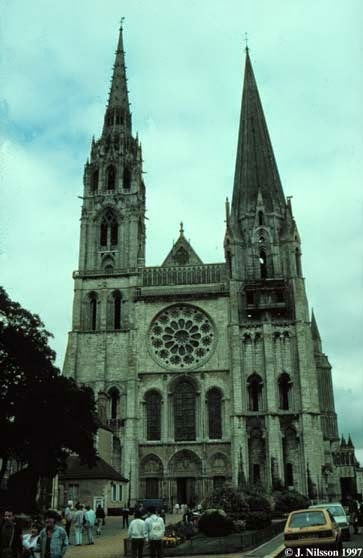 Form: The Cathedral is initially built in the Romanesque style. 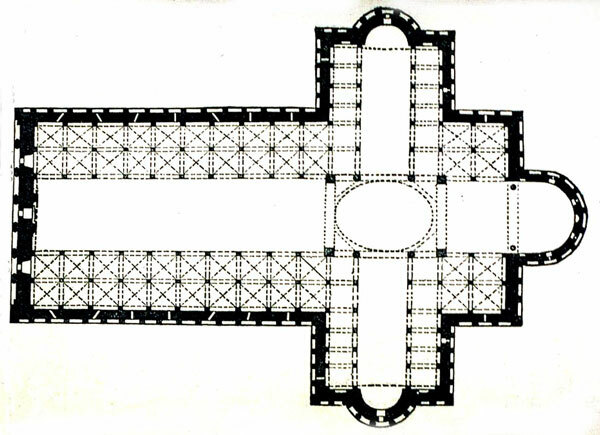 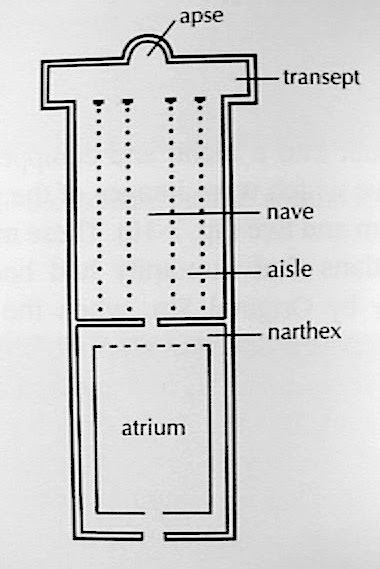 The overall plan is a Latin cross plan with a dome floating above the crossing of the nave and transept. 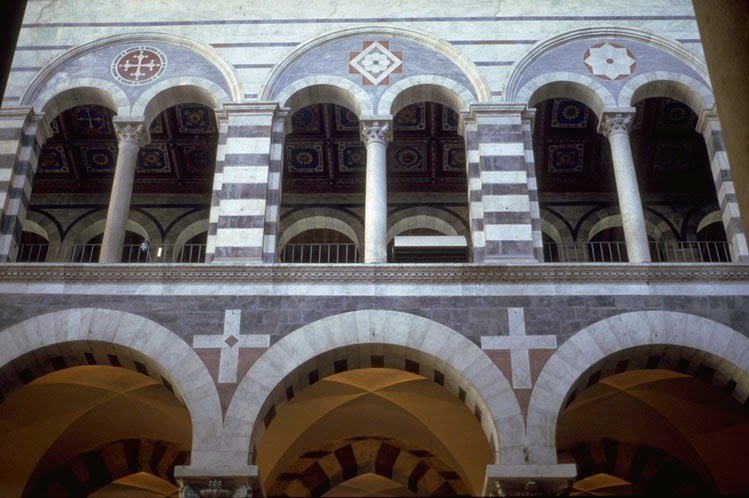 The facade is white marble with a simple looking arcade of Roman style arches atop classical, almost Corinthian style columns. 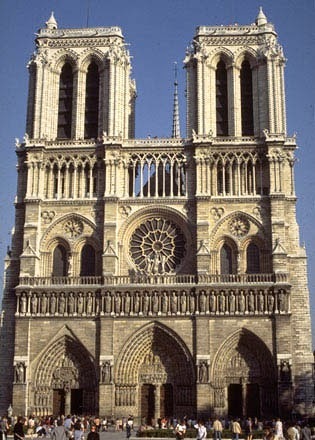 The overall order is symmetrical, squat and very predictable and geometric. 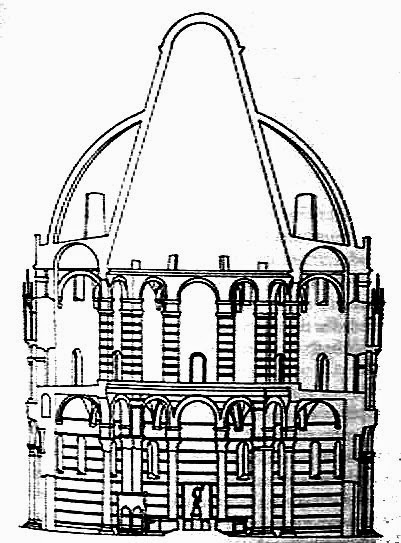 The dome, which is a later edition, is almost an onion or egg shaped pointed dome which is different from the type of simple dome that we might come to expect from buildings such as the shallow half dome of Hagia Sofia and or the perfect half circle of the Pantheon. 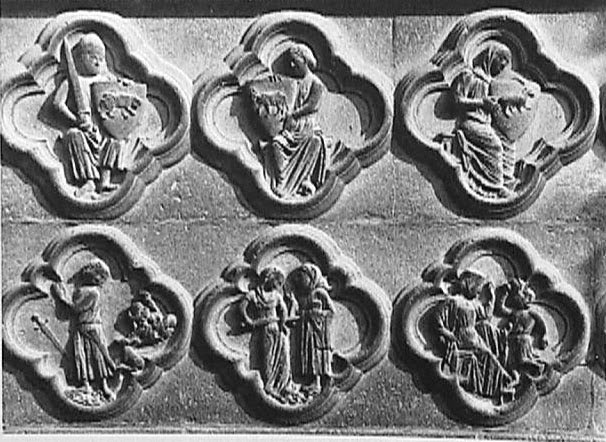 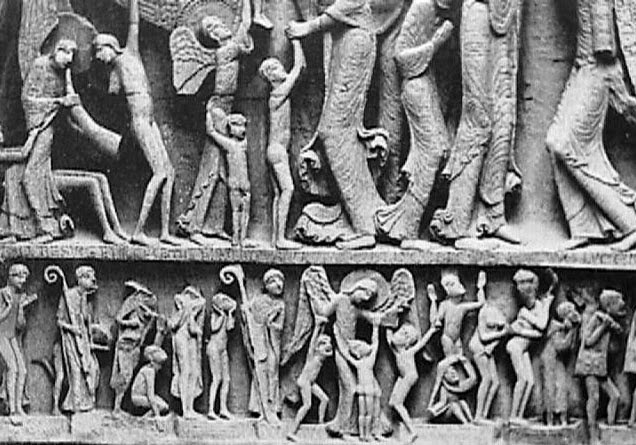 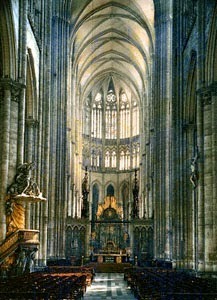 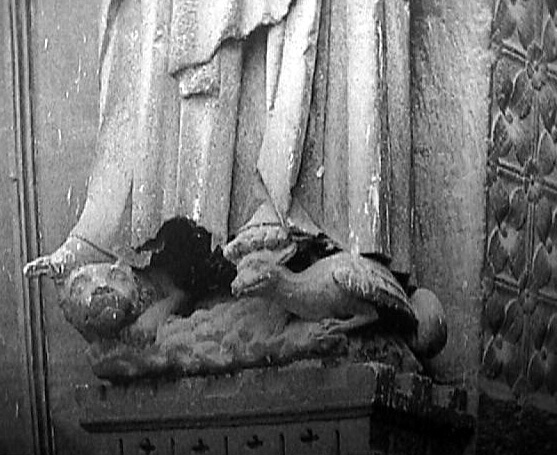 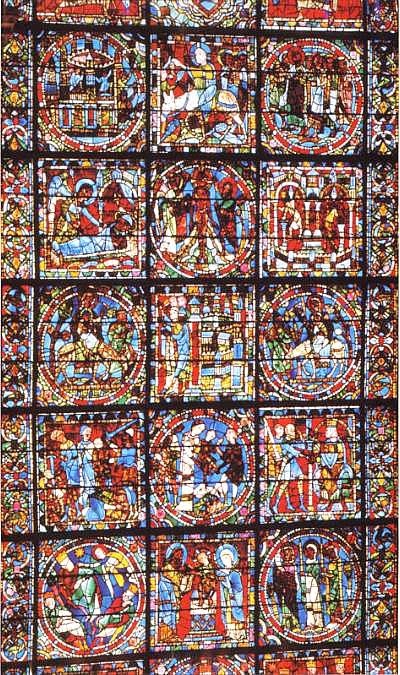 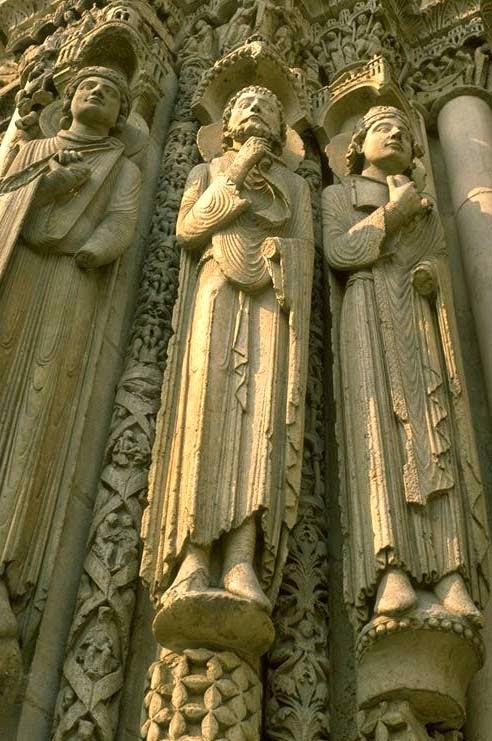 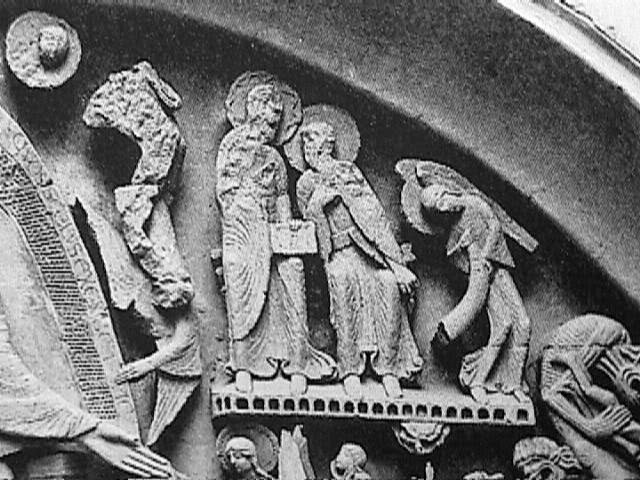 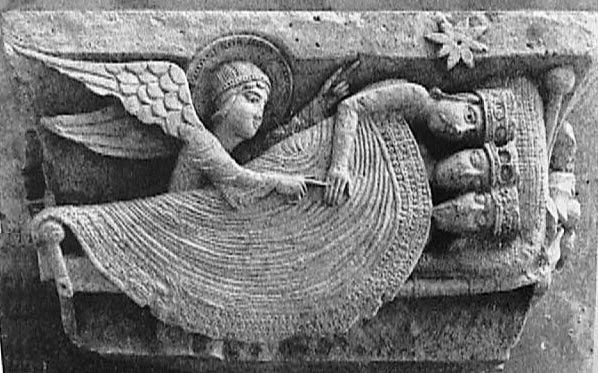 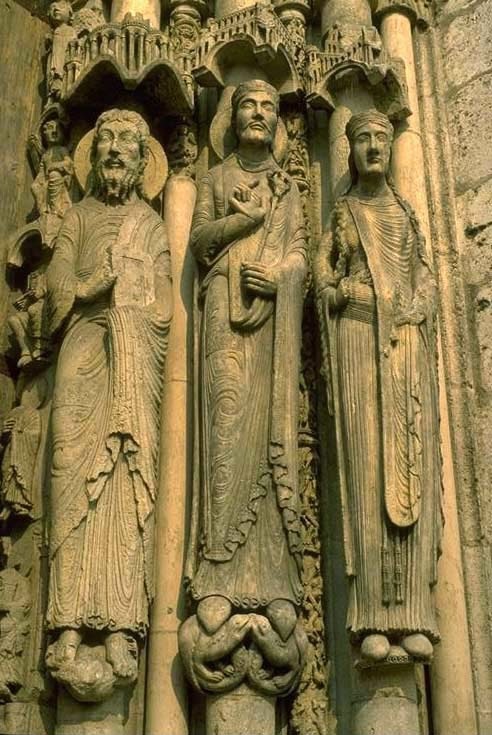 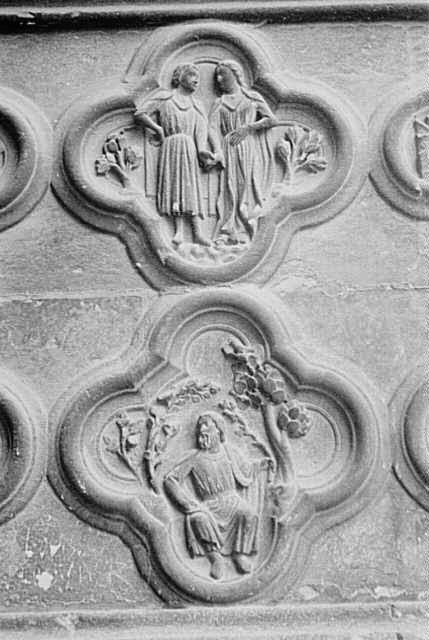 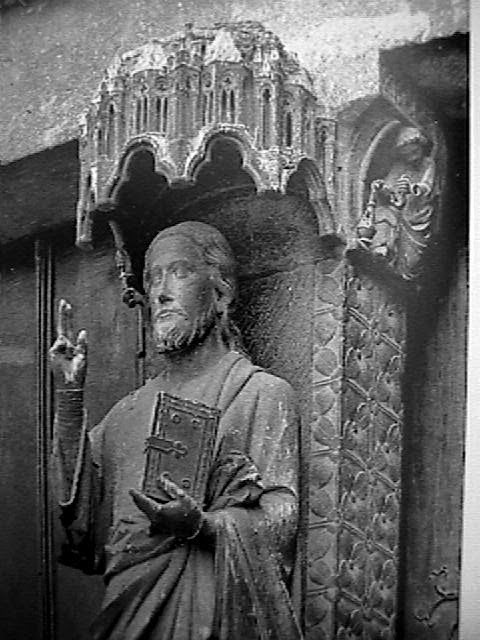 Read Stokstad 556-612 Form: Cathedrals, in general, were made completely of stone for permanence. 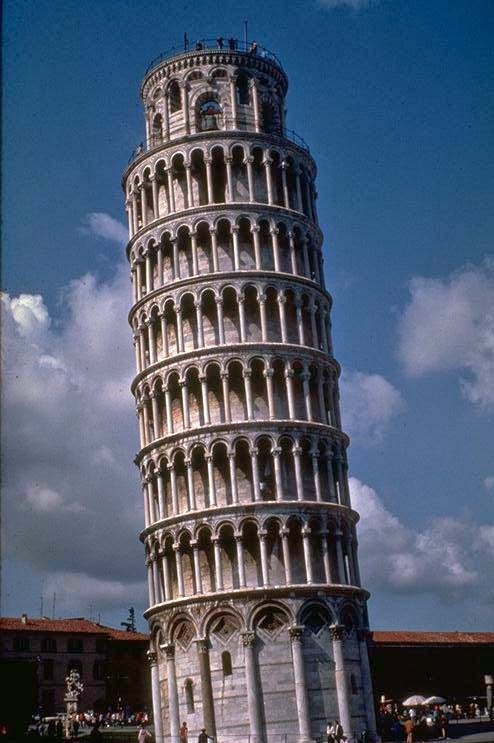 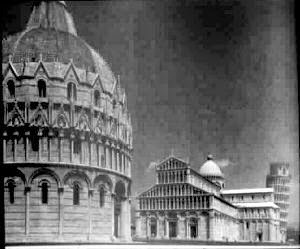 The construction of the cathedral, although derived from the basilican plan, is a non-uniform shape. 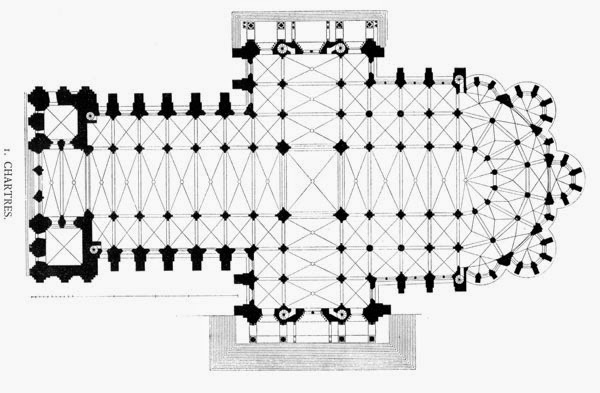 The addition of the transept and the bays in the apse tend to make the shape fairly irregular. 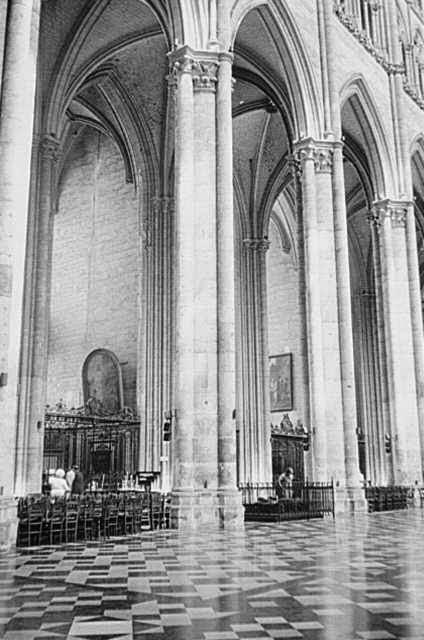 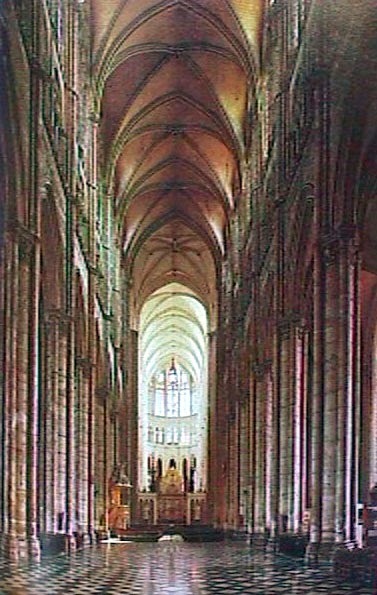 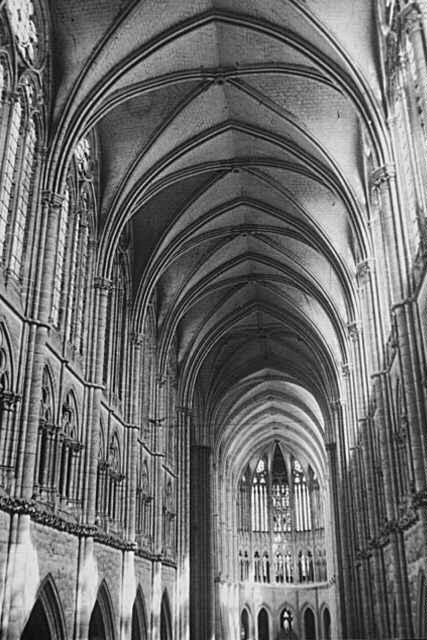 Interior of Amiens Cathedral The main two design innovations evinced in Gothic architecture are the perfection and use of the ribbed groin vault and the use of flying buttresses. 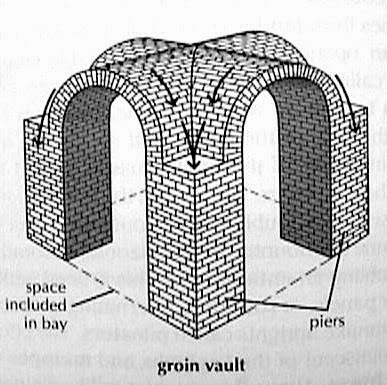 Groin vaults needed massive walls to support the side stress created by them. 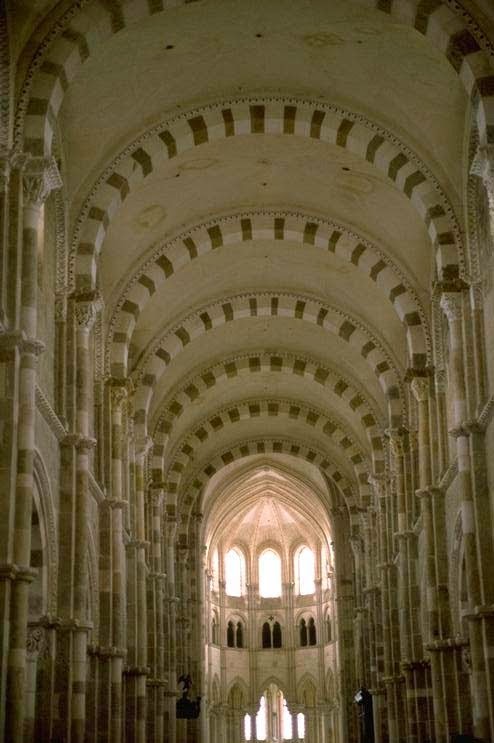 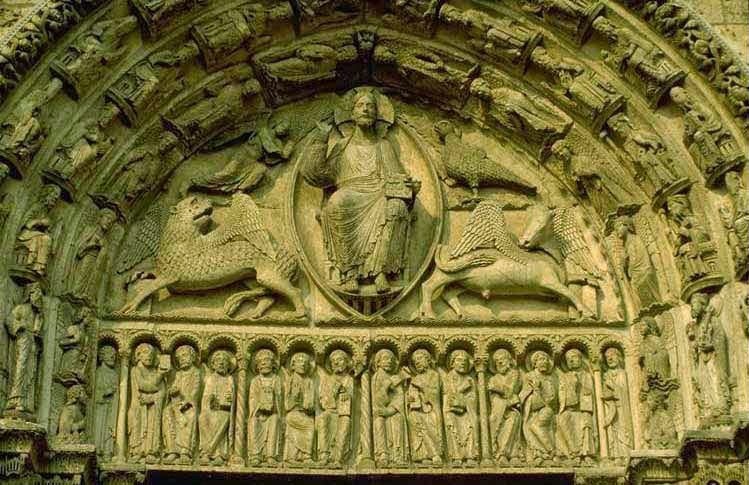 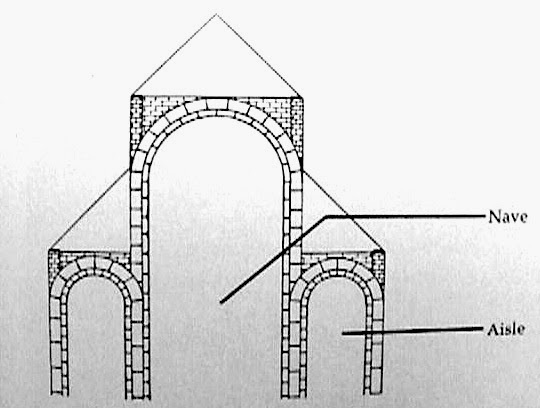 In order to compensate for this and relieve some of the outward thrust of the traditional barrel vaults that one observes in Romanesque architecture, pointed arches were introduced. 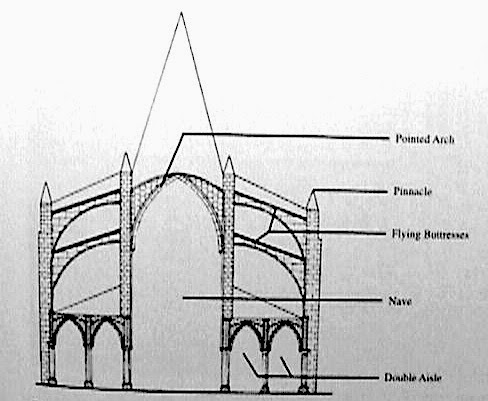 These arches change some of the outward thrust to downward thrust. 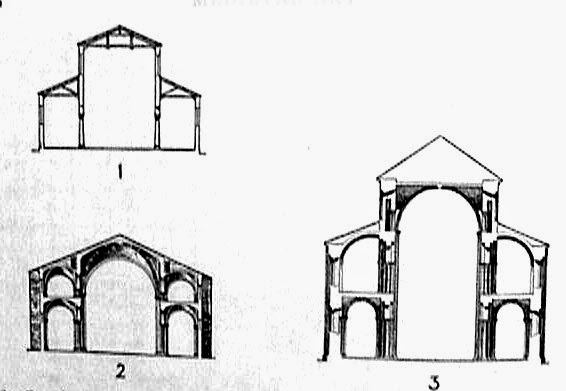 The pointed arch also allowed for more flexibility in terms of the space that the arch could span. 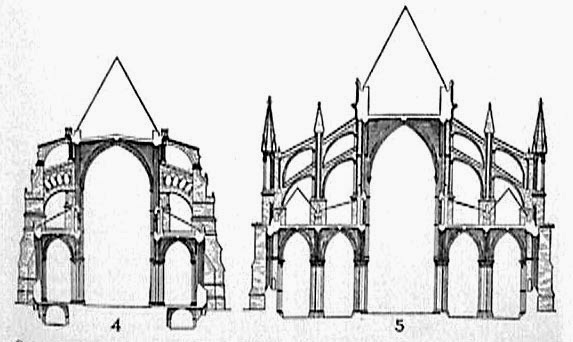 Flying buttresses absorbed the rest of the force generated by the arches. 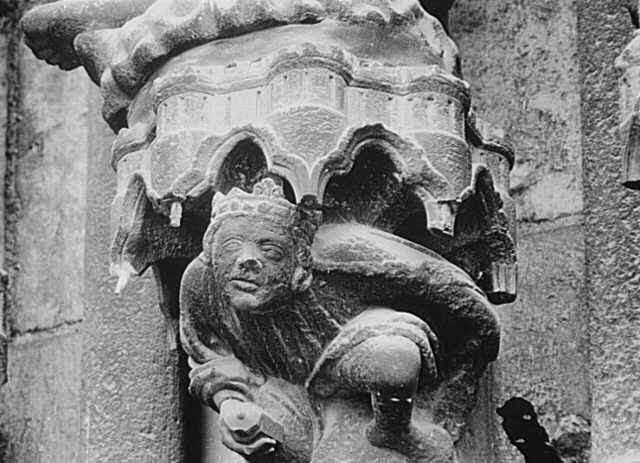 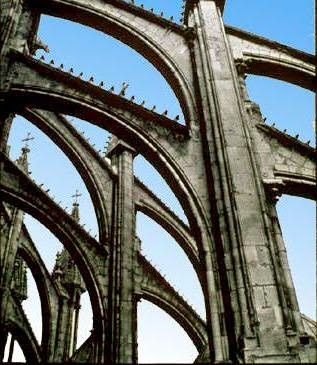 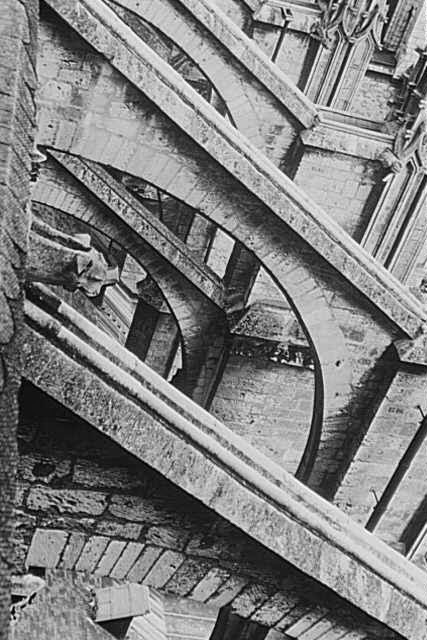 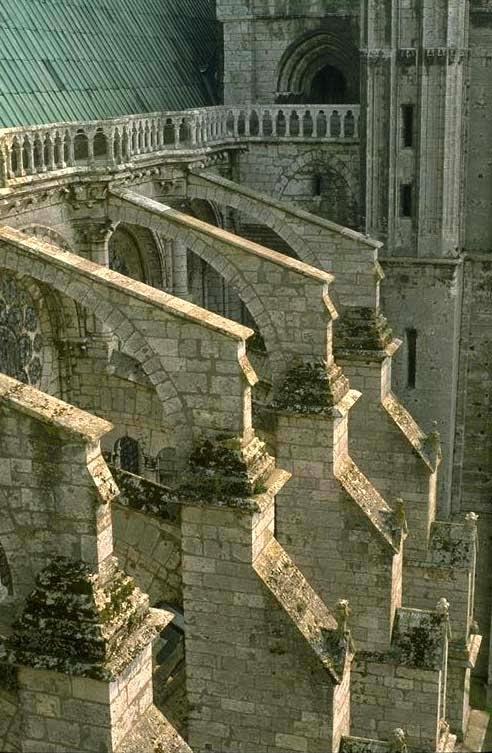 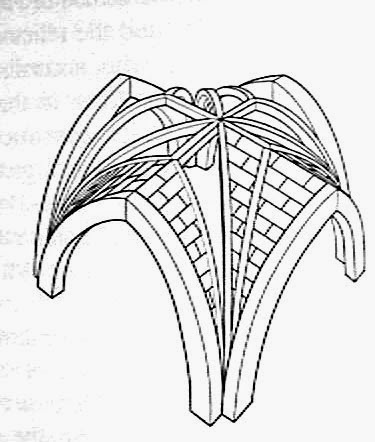 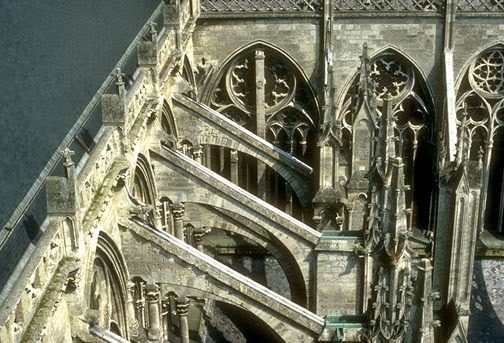 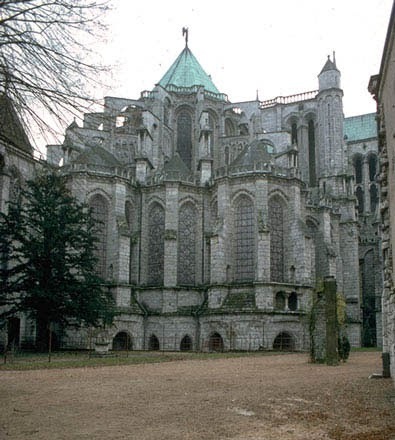 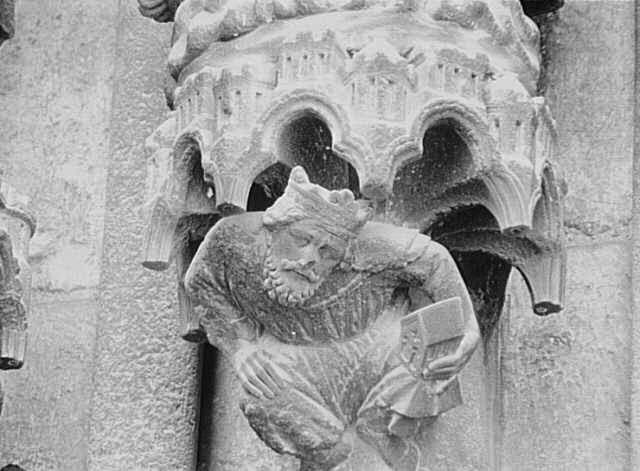 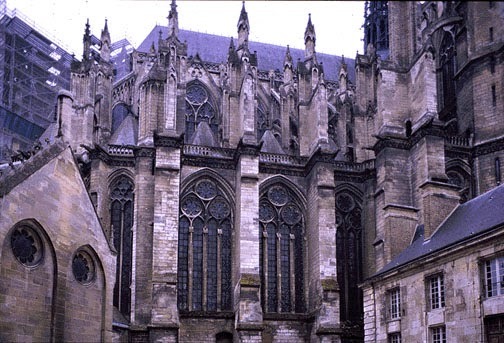 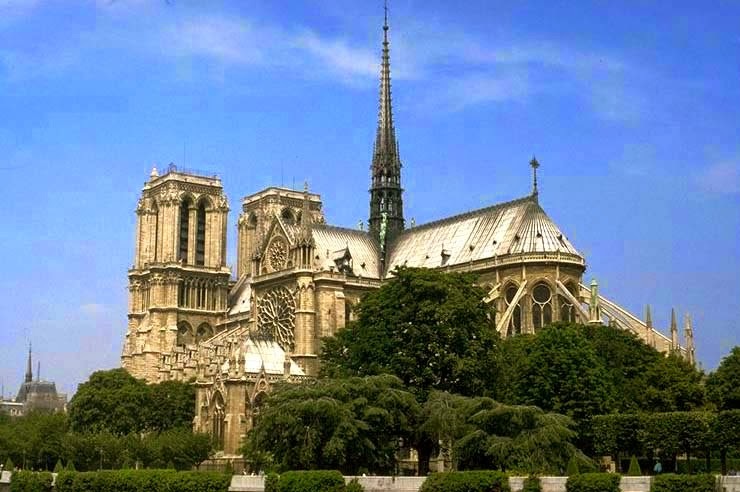 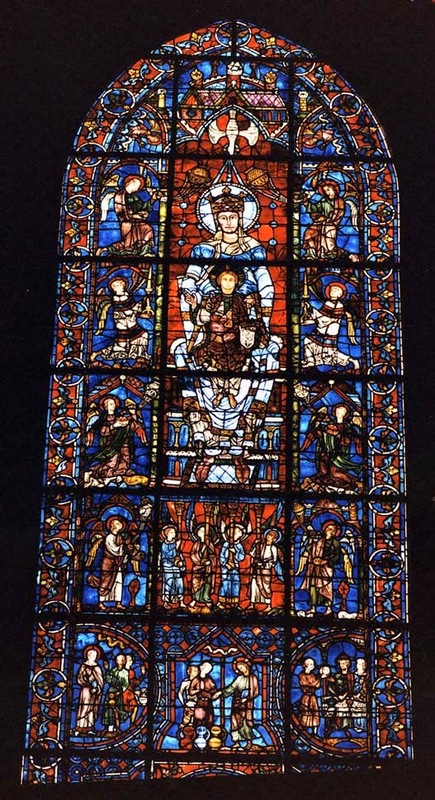 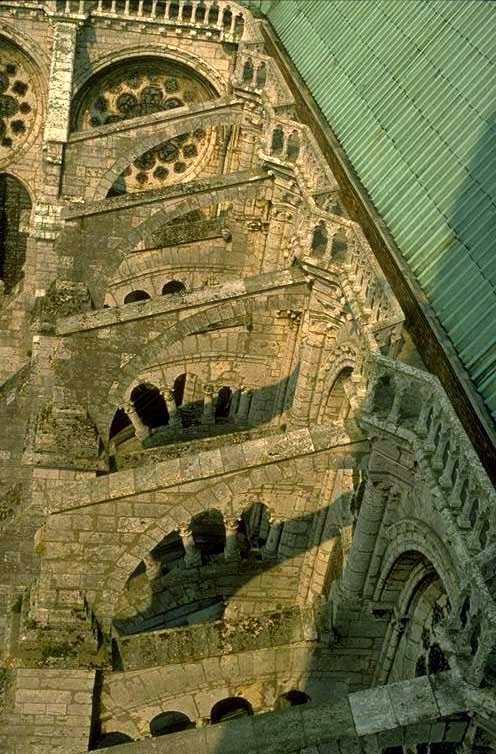 Flying buttresses are essentially an exoskeleton which take a great deal of the stress off of the inner walls and allow them to be built taller and thinner and with large openings for stained glass windows. 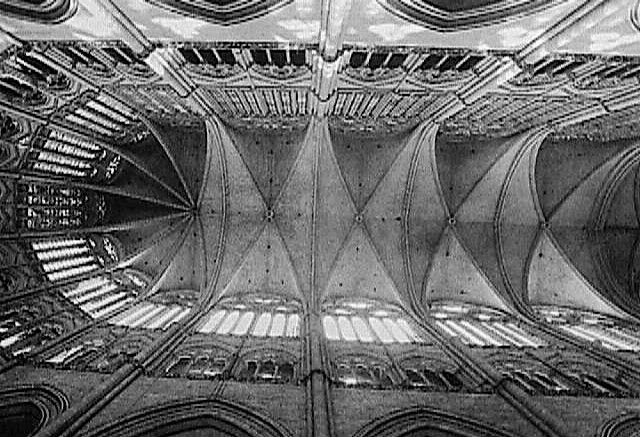 Interior of Amiens Form: This is an interior view of the ceiling in the main part of the cathedral. 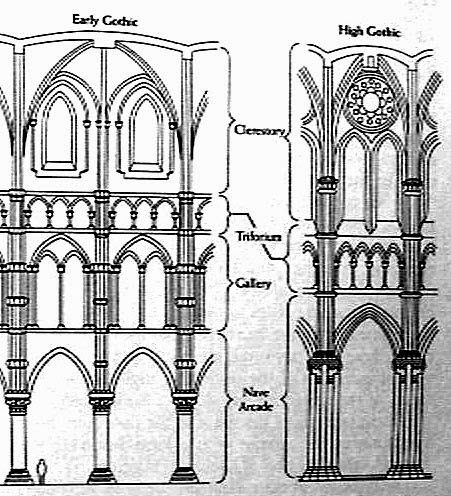 Iconography: One can easily see the vaulted structure of the ceiling, which not only provides support, but is aesthetically pleasing to see. 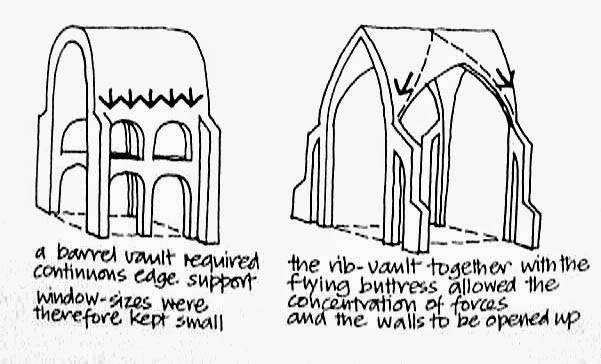 This type of vaulting is crucial in making the high, soaring ceilings possible, without it, the ceiling would be too heavy and the whole structure would collapse. 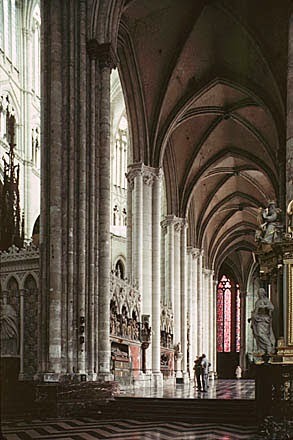 It also serves to allow as much light as possible in, giving the cathedral an ethereal glow during the daytime and especially while services are being conducted. 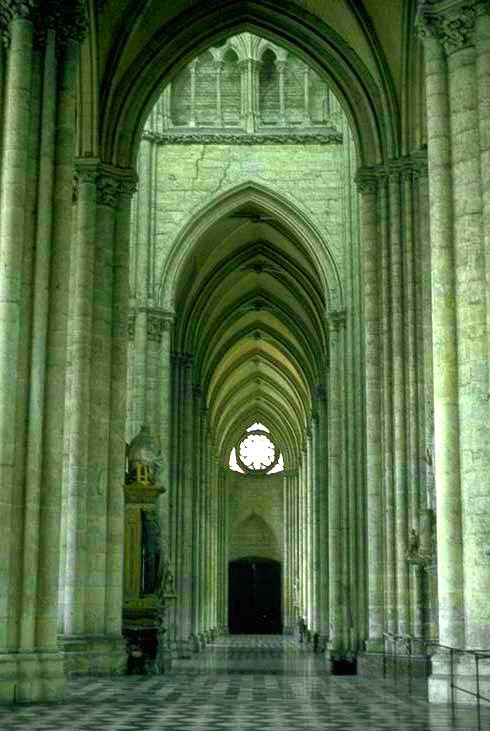 Much the same way transcendentalists saw nature as representing the beauty of God, the light pouring into the cathedral reminded worshippers why they were there. 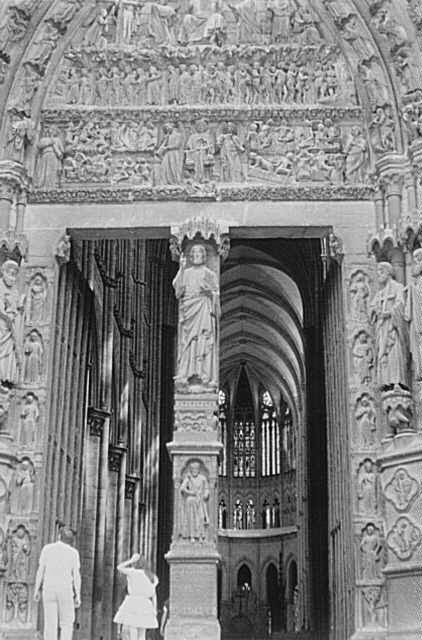 Along with the ceiling, almost every part of this area of the cathedral was covered with carving and decoration.This was to make the interior appear valuable and precious. 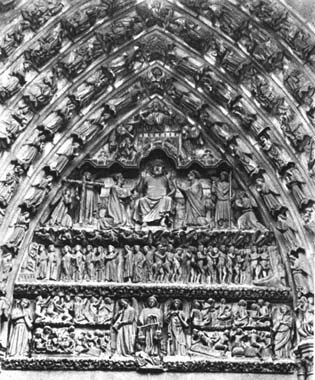 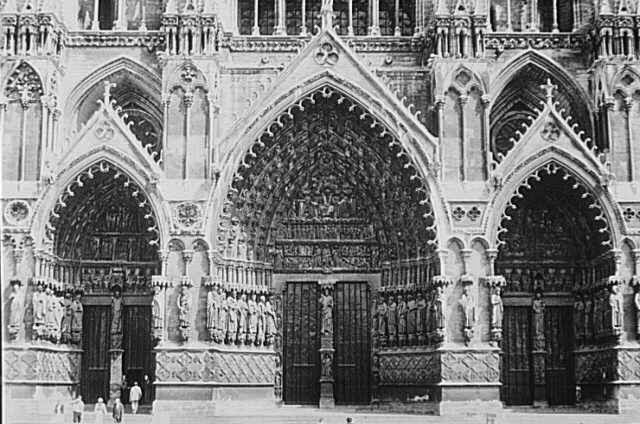 In addition, it was supposed to give the impression of the gates of heaven, which were often characterized as ornate and possessing a beauty that surpassed anything that mankind could create. 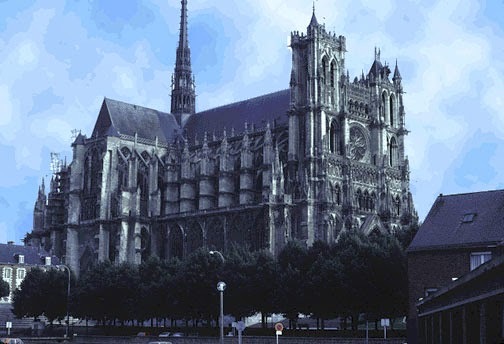 An Amazing Gothic Cathedral When first enrolling for this course, I was hesitant. 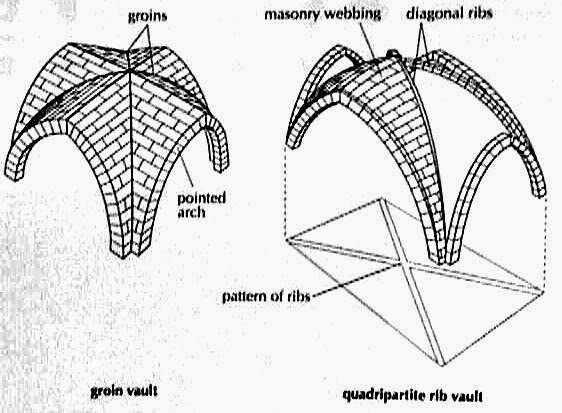 I did not think I would enjoy any of it and much less find that I would actually be interested in anything that was introduced to us. 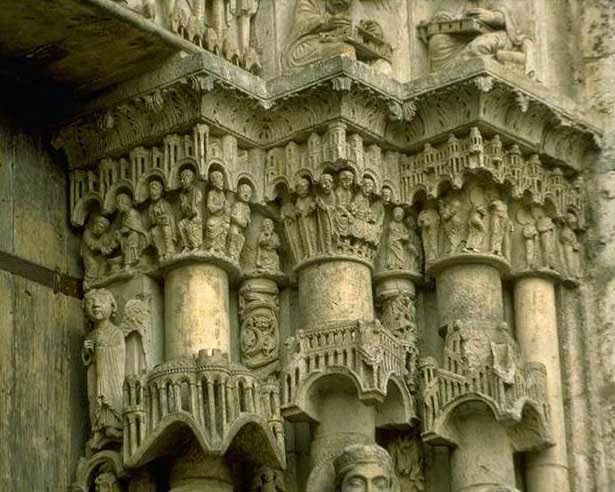 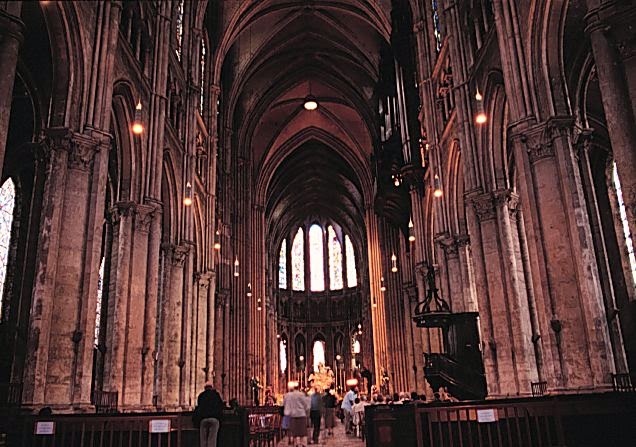 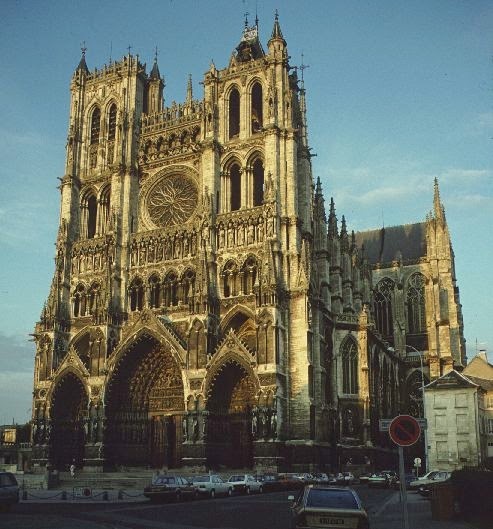 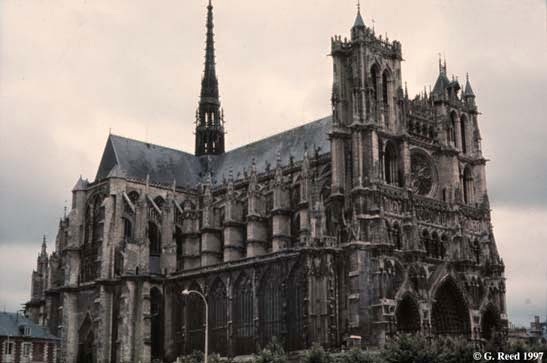 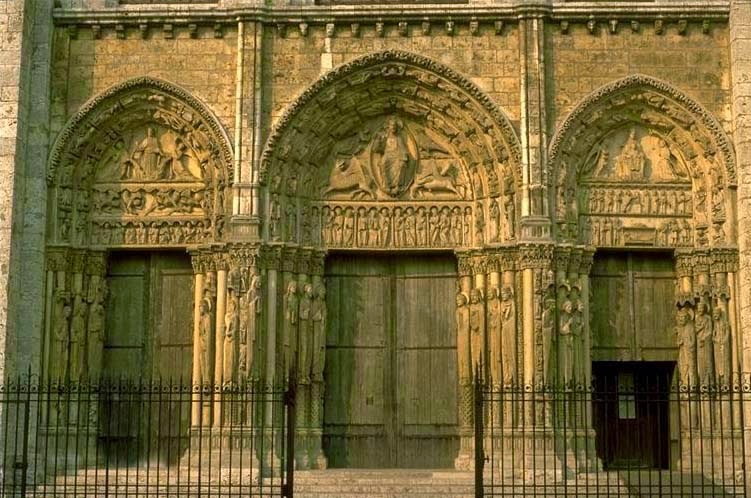 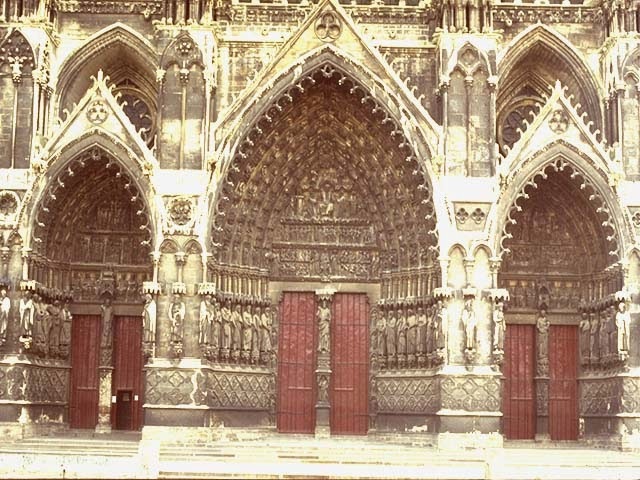 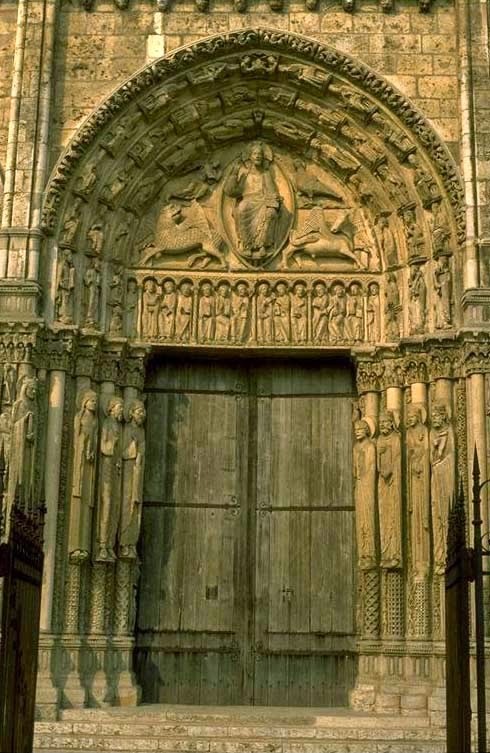 I have found myself appreciating every piece of art that we have seen, but there has been one piece of architecture that has amazed and inspired me more than any other, and that was the Cathedral of Notre Dame at Amiens, also known as the Cathedral of Amiens. 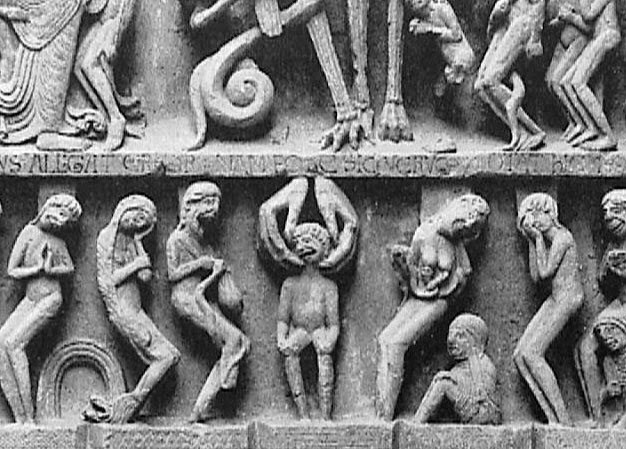 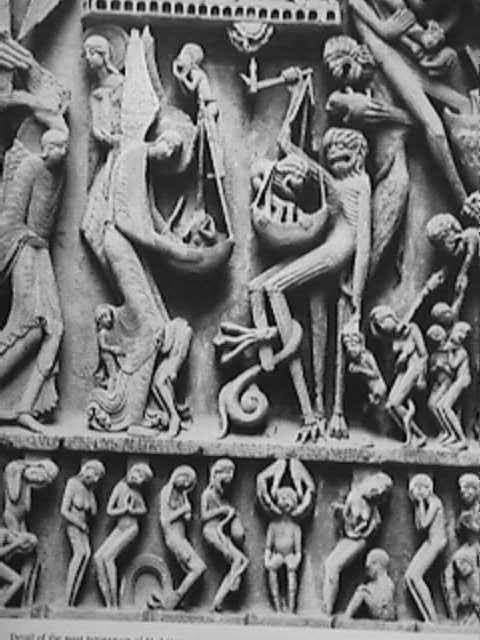 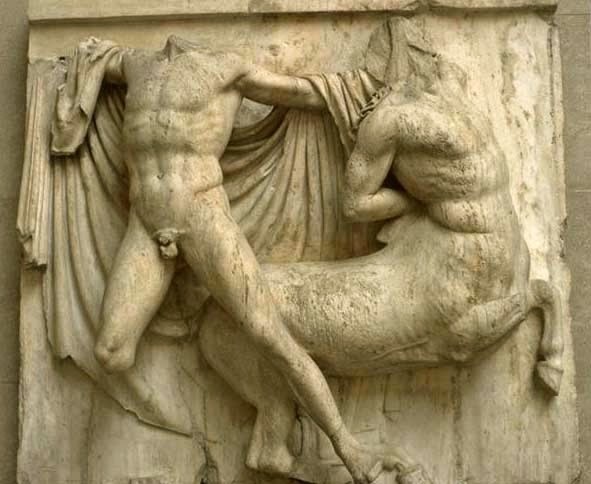 The symbolism found in almost anything you decide to set your eyes on is enough to intrigue anyone. 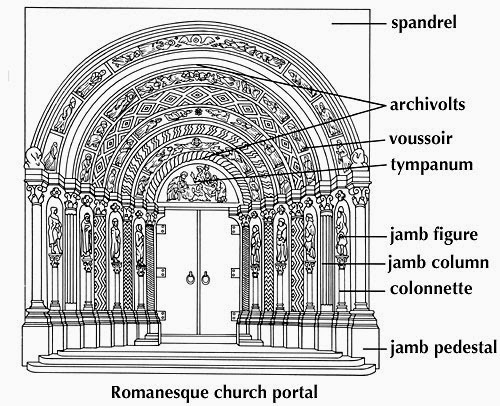 Everything in its interior and exterior is equally heavenly and majestic.